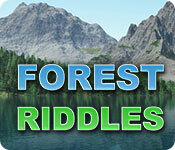 Forest Riddles is rated 4.5 out of 5 by 17. Rated 5 out of 5 by KingBobCat from Great Game! This is by far my favorite gridder type game that I've played on Big Fish! Very easy to use and intuitive interface as well as challenging (without being too tough) gameplay. Give the demo a go and if you like this kind of game, I'm sure you'll buy. Rated 5 out of 5 by AdrianaIP from Griddler game done right I think that I have a hard and fast rule about griddler (or nonogram) games: If the title says "griddler" or "puzzle" or "riddle" you can be fairly sure that it will be solved by pure logic, and not be ruined by powerups - if it says "mosaics". unless it is World Mosaics, pass it by because you will run across a lot of puzzles that can be solved only by hints, or by studying the picture - but the picture is pretty so why are you complaining? This one is a pure logic game. Soothing music and background, soft, wooden colors for the tiles, and crossed out tiles just disappear. Numbered tiles and highlighted rows an columns... What more do you want? Rated 5 out of 5 by jil1 from Challenger and wonderful! Loved it. This is a very good game, a different kind of mosaics... Interesting and you can´t stop playing. I´m already waiting for more of this. Of course I recommend. Rated 5 out of 5 by Wang1007 from Fun Mosaic Game Absolutely loved the auto remove, not to hard, a great game to relax by after work. Rated 5 out of 5 by Bugirl from We want more! I have played many of these types - call them riddles or mozaics, I call this one "the best" of them all. Good challenges and lots of levels are just 2 great points. I hope they continue these the way "Mozaic World" series have. I want more!!! Rated 5 out of 5 by Kafinkee from A New Favourite for Me! Just finished the demo and signed in to purchase. I really enjoyed playing this one -- visually pleasing (love those wood-coloured tiles!) and more challenging than the penguin series which I find a little too easy. One of the best, if not the best, mosaic games I've ever played. If you like this genre, I recommend you give Forest Riddles a try. You won't be disappointed! Rated 5 out of 5 by kristidumplin from One of my favorite kind of games! I like this game very much - wish it had more colors, as I've been rather spoiled by Fantasy Mosaics and other games that offer a bit more visual appeal, but, that being said, the game is quite nice. The mechanics work well and I like the "auto remove" option so I don't waste time removing empty squares. After playing about 25 levels, I've encountered only one problem. The game is supposed to automatically mark when a square has been marked, but, there have been a few times when that hasn't happened, so pay attention and don't expect the game to work perfectly. 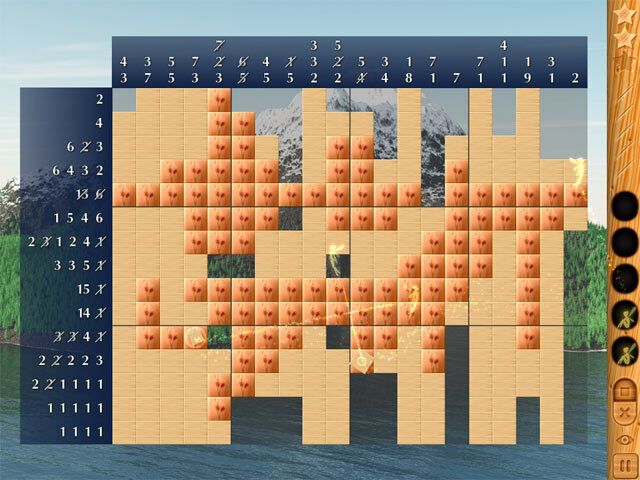 It does, for the most part, but pay attention to whether or not the game has put that slash through the number correctly on the left of the puzzle grid. Overall - it's pretty, needs colors, nice pictures behind the puzzles, and works well. Rated 5 out of 5 by sunnyglow from A RELAXING ROMP IN THE FOREST A BIG THANK you BFG for providing this game today. I have completed all the latest nonogram games available and was wondering when another would appear. This is one of my favorite gaming genres. It does not have the color spectrum or the variety of screens as some other nonogram games; however, it does have the feature of auto-fill. In this game, it does eliminate – not just X out – the blank spaces. Having created a few of these (by hand, no less), I can appreciate the work involved in creating these puzzles. This is a great puzzle to play if you are working on a project and need to concentrate your thoughts. I usually don’t care for the “muzac” in these games; however, the soundtrack is rather mellow and relaxing in this game. 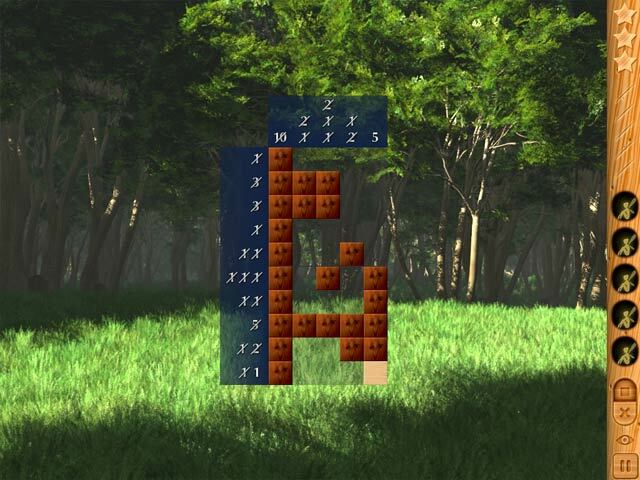 There are 5 levels with 20 puzzles per level, or 100 puzzles in total. The grid varies in size which is a nice feature. It seems you get 5 fairies (hints) to help you and there are 3 stars you can earn based on the amount of errors you create or the fairies you use. There is nothing spectacular in this game – no gimmicky extra screens, bold colors, or story involved. It is just a nice relaxing game creating pictures based on the theme of the woodlands. Actually, I prefer simplicity in these games. I see others have detailed the game. I am short of time today to go into any detail; however, I did want to express my gratitude. Rated 5 out of 5 by margot01 from A very good griddler game This is a perfect game in my opinion. 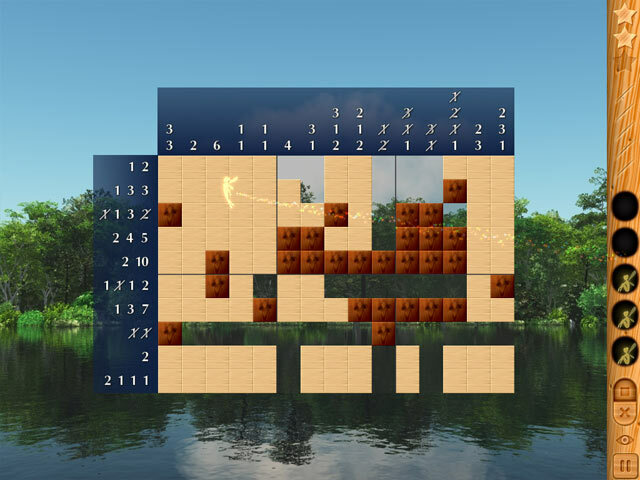 Smooth gameplay and very relaxing on the eye with the wooden tiles and the crossed of numbers being removed. I like the single colour aspect, because I think the multiple colours make the game to easy. Despite of what Biscuitsmama said, there is a consistancy in eliminating correctly marked cells. They are only eliminated when there is no other option available for that particular cell. I liked that about this game, because lots of other games give to much away. For me Gizmo's is the best griddlergame, but it's a close finish with this one.